Caption The Atapuerca Mountains Sierra de Atapuerca in Spanish is an ancient karstic region of Spain in the province of Burgos and near Atapuerca and Ibeas de Juarros. It contains several caves where fossils and stone tools of the earliest known Hominins in West Europe have been found. The sites in this area were found during the construction of railway cuts through Gran Dolina Galería and Elefante and in the cave of Sima de los Huesos. The scientific excavation started by Francisco Jordá Cerdá in 1964 has found human remains from a wide range of ages: early humans to the Bronze Age and modern man. Sites in the area have also yielded stone artifacts. It was excavated by a team led by Emiliano Aguirre from 1978 until 1990 and then jointly by Eudald Carbonell José María Bermúdez de Castro and Juan Luis Arsuaga. The regional government of Castile and León has designated the site an Espacio cultural. The Zona Arqueológica sierra de Atapuerca is protected under Spanish law as a Bien de Interés Cultural. Headline The earliest hominids may have dated to 1.2 million years ago representing the first in Europe. 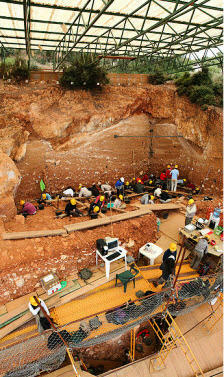 "The Archeological Site of Atapuerca" has been designated a UNESCO World Heritage Site.